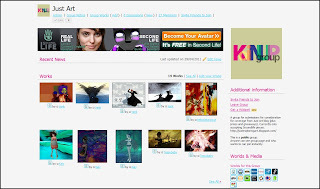 There's a new interesting blog with the radar over Machinima and Art created/inspired by Second Life. It's called Just Art. The blog authors are some well known and so much appreciated machinimists and artists of Second Life: Bryn Oh, Colemarie Soleil, Persia Bravin. Starting from the next week, Just Art will feature any week, a Koinup machinimist or artist/photographer within a special column dedicated to the Koinup community.